Ditch the bulk! Thirsties duo Fab Fitteds are shaped for a trimmer appearance and fabulous comfort for your mobile baby. Expertly crafted from stretchy, buttery soft textiles with a stay-dry liner, these super cute fitted diapers offer superior wetness protection for your baby’s delicate skin. The internal soaker is composed of three layers of spongy microfiber terry that can absorb up to seven times its weight in liquid! There is a tunnel behind the soaker which allows for better washing, quicker drying, and stuffing of additional absorbency when needed. Touching your baby’s skin is the microfleece layer that is oh-so-soft to the touch and works to keep your baby feeling dry, thereby helping to prevent diaper rash. 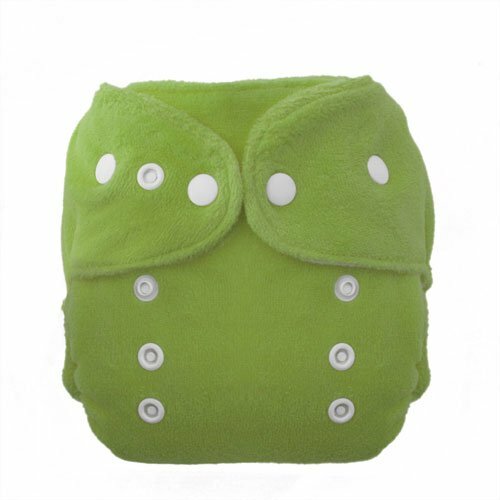 Encased elastic wraps snugly, yet gently, around your baby’s legs and torso to provide the very best protection from leaks. Remember, although you’re not going to want to cover up these adorable, ultra-soft diapers they are not waterproof on their own. We recommend pairing with a Thirsties Diaper Cover or Duo Wrap for a truly leak proof system. Both hook & loop and snap closures are available on Thirsties Duo line. While many families prefer hook & loop closures because of the simple, secure fit they provide, snap closures do have a few advantages of their own. They are pretty much indestructible and are more unyielding than our hook-and-loop closures, making them more challenging to unfasten for a toddler who prefers to go naked. Be the first to review “Thirsties Duo Fab Fitted Diaper” Click here to cancel reply.